There were no injuries, and firefighters managed to extinguish the blaze. 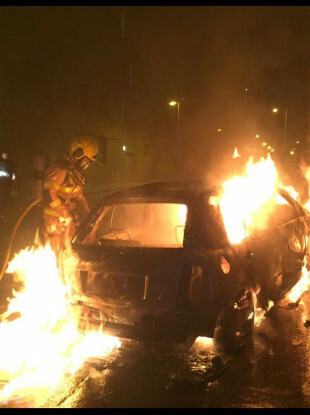 DUBLIN FIRE BRIGADE crew members came under attack this evening as they extinguished a car fire in Dublin city centre. Units from Tara Street station were were called to extinguish a car fire in the city earlier today. A DFB spokesperson said that firefighters had rocks thrown at them as they tackled the blaze. The spokesperson said that garda were called to assist in the incident. There were no injuries, and firefighters managed to put out the fire. Earlier, Balbriggan firefighters in breathing apparatus rescued one person from a house fire following a number of emergency calls. Fire engines from Skerries, Swords and the Swords National Ambulance Service were also at the scene. Email “Dublin Fire Brigade crew have rocks thrown at them as they tackle car blaze in city centre”. Feedback on “Dublin Fire Brigade crew have rocks thrown at them as they tackle car blaze in city centre”.